Itasca Moccasin was formed in 1986 in the tiny community of Lake George Minnesota, located just to the east of Itasca State Park, famous for being the headwaters of the Mississippi River. The original store was a rustic, shopworn souvenir stand that attracted tourists driving to and from the park. The founder, Mardel Bents, learned the moccasin-making business after having been sold a set of used equipment from a local craftsman. She spent each winter making handcrafted moccasins in preparation for the summer tourist season. As each summer progressed, supplies dwindled until they were replenished over the next winter season. Despite the humble beginnings, Bents and her sole employee (now the store manager of our Factory Store) ran the business in a manner that began to separate us from our competitors. First, besides using basic cowhide leathers, she sought out premium game hides from moose, buffalo and elk – all offering a much more luxurious feel than basic cowhide. Second, she incorporated lots of color whenever she was able to, which made our moccasins look different than those found elsewhere. Lastly, she perfected custom fitting techniques that allowed customers with hard-to-fit feet to get pairs that fit perfectly. In April 2012, Bents retired and sold the business to Paul Kirkman who, if nothing else, was wise enough to retain the company’s sole employee. Kirkman rebranded the company as Itasca Leathergoods to extend the store beyond its moccasin-making roots and focused on creating a more fashion-forward vibe that was more closely aligned with its heritage and premium-quality craftsmanship. The overhaul was extensive and included a fresh logo with nod to our history, a new website and renovated Factory Store, a focus on sourcing the best quality leathers rather than sourcing the best deal, and most of all, a focus on refining the moccasin styles and colors. Kirkman attempted to broaden the company’s geographic footprint and opened satellite retail stores in Crosslake MN and Hayward WI. After a five-year run, a decision was made in 2017 to close those stores because the summer tourist season proved to be too short when we had hoped to operate them as year-round businesses. Currently, we focus on our original Factory Store, online orders, wholesale orders to small independent retailers, as well as producing private label product for a national catalog company. Leather bracelets – unique, great stacked together. 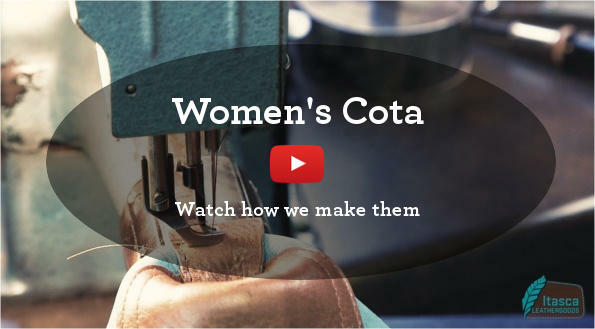 Since most of our online customers haven’t visited our Factory Store to see production in person, we’ve created two videos that demonstrate the entire manufacturing process – edited down to approximately six minutes. 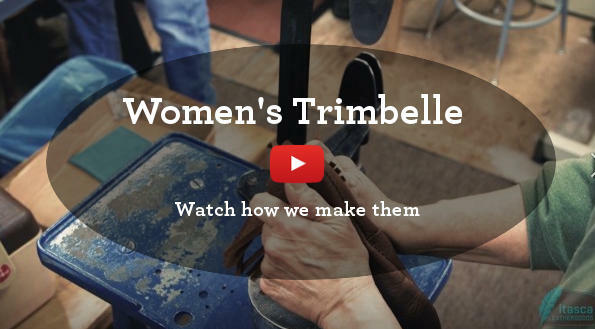 You’d be amazed at the work that goes into these handmade moccasins! We will continue to introduce new products. Items on the drawing board include home goods (e.g. decorative pillows and Christmas decor), wallets, and small leather goods intended for the gift marketplace. We will continue efforts to connect more with our customers through social media, blogs and other outlets to expand brand recognition and reputation throughout the country. We will focus on our custom work for hard-to-fit feet. We sincerely thank you for your interest in Itasca Leathergoods and for the part you play in making us successful.